Quite the amazing performance by the Sharks in their dominant 5-0 win over the Pittsburgh Penguins. My hatred for the Penguins may only be matched by my hatred for the Detroit Red Wings, and to see the Penguins demolished was beyond gratifying. I was definitely wrong about Evgeni Nabokov. I don’t know what conditioning regiment this guy is on, but put the entire team on it. Three games in four nights and he comes out with a shutout. He stopped all 27 shots he faced. Wow. Can’t give him enough credit. San Jose battled for every puck and came out with it most of the time. No one relaxed much — even after gaining a 4-0 advantage going into the third period. Jamie McGinn scored the first goal from a bank-in off Marc-Andre Fleury’s left pad. You could feel something good was going to happen the whole night. Joe Pavelski, yes, Joe Pavelski, finally came back to the lineup tonight after being out since the second game of the year. He didn’t disappoint. He put up two points (one goal, one assist) and didn’t have much rust. His assist really should have been a goal; the puck was headed in, but Dany Heatley slammed it home when the puck was about one inch from the goal line. Gotta love Heater! Dan Boyle owned the ice tonight. It was his. No disputing that. He continuously carried the puck from the defensive zone all the way to the net for scoring chances. It looks like that broken thumb is fully healed, and he’s on a mission to contribute. One of those times coming down the ice, he deked a few Pens and snapped a shot past Fleury. That was the end of Fleury, who was pulled right after. He allowed three goals on 14 shots. Pittsburgh mailed it in during the third with some late hits and a few scrums. They became frustrated and tried taking it out on Sharks tough guys. Yea, not a good idea. Jay McKee made a run at Jody Shelley, who wasn’t really looking. The two dropped the gloves and Shelley ended up taking McKee down. Well, you think that would be the end for Shelley. He did his job, and can resume his role in the fourth line. Oh, contraire. Eric Godard tried his hand at Shelley and Mr. Shelley handed Godard’s derriere to him on a bloodied, silver platter. Jersey jabs and right hooks galore from Shelley. Thank you! Come again! Jordan Staal, much to Sharks fans’ amazement, took a few runs and delivered an elbow to Douglas Murray. Staal better watch himself in the parking lot. I may not be a big fan of Murray’s, but to deny his skills in fighting and toughness would be ignorant. Come on now Staal. You can’t bring your peach fuzz to a swedish meatball fight. I got a little worried when the Sharks weren’t putting more goals in. They seemed to be a bit complacent for a stretch in the third, but it was those scrums that fired them back up. So, that would be the only criticism of the night. The Sharks ranked last in power play efficiency at home, somewhere around five percent. They netted two goals on the man advantage tonight. The entries and forecheck looked better tonight. Passes were sloppy, however, leading to Penguins clears and breakouts. NHL GameCenter Live used Pittsburgh’s feed and all the commentators would talk about is how injuries caused their recent play. Give me a break. Take a look at the Sharks who’ve been playing with five key players missing from their lineup, and they still managed to win six in a row. The Penguins just didn’t show effort tonight and looked awful. It won’t kill you to say that. Hit-O-Meter: SJ 19 PIT 25; Scott Nichol and Murray both led with three hits a piece. Sidney Crosby now has just one point in four games against the Sharks. Isn’t that great? San Jose has his number, and the Penguins’ number for that matter. San Jose lost the faceoff battle. They lead the league in faceoff percentage with 56.8, and for them to lose to 19th-ranked Pittsburgh is surprising. The Sharks get two days off before facing Nashville on Tuesday. The Sharks will look to extend their point-streak to nine games. The whole state of Pennsylvania. It’s full of the luckiest teams in the world and most annoying players. The Steelers are THE worst team to ever win the Super Bowl and they’ve done it twice in the 2000s. No, it is not skill. They barely win games, either by refs or magical lucky comebacks. Of course, fans will say that’s why their good– “They win, it doesn’t matter how.” Well, I’m not a fan, so I can say what I want, as you can. Ben Roethlisberger is a terrible quarterback. Fact. I hope Troy Polamalu is out for the season after his injury tonight that way I don’t have to hear the constant media coverage of his hair and playmaking ability. Not to mention Troy went to USC, which is just as bad as Pittsburgh and Pennsylvania. The Penguins are also THE worst team to win the Stanley Cup. Give me statistics all you want, but I will still say Marc-Andre Fleury is the worst goalie to win it. Sidney Crosby is just an overall buttwipe in all aspects of life. 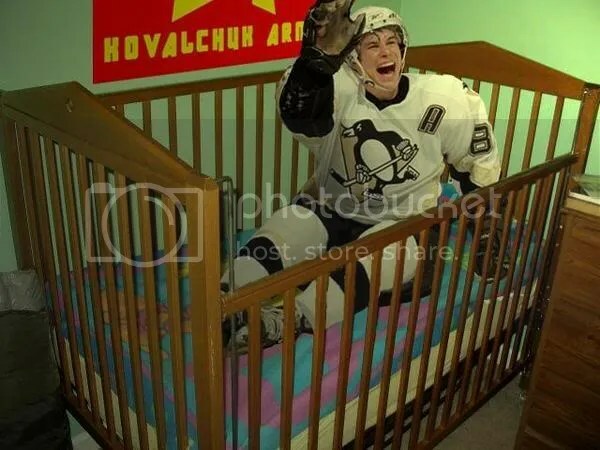 Now, NBC and the NHL will promote him even more after he won the Cup. The whole Penguins team is soft and are not deserving of such an amazing trophy. The Eagles are so freaking annoying. 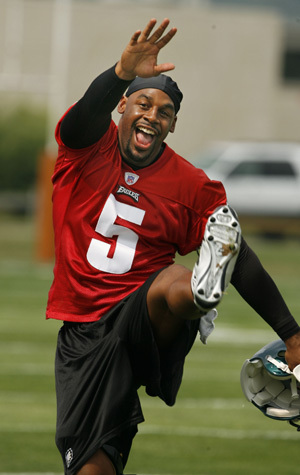 I’m tired of them winning and McNabb. Fans will always call you jealous for saying that but whatever. Let’s have a new team in the playoffs. Like the Cardinals! More of them! Just ban Pennsylvania from pro sports. Life would be amazing. Lace up your skates and hit the ice — it’s hockey time. Ron Cortes/MCTPittsburg Penguins’ Sidney Crosby celebrates a goal by Ryan Malone during last year’s Eastern Conference Finals against the Philadelphia Flyers. The NHL season starts Saturday in Prague, Czech Republic, with the New York Rangers taking on the Tampa Bay Lightning. This season begins after numerous offseason signings and trades that are sure to shake up the standings. Will the Detroit Red Wings repeat? 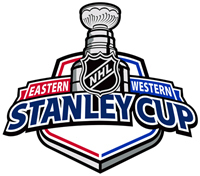 How will the local teams, Washington Capitals and Carolina Hurricanes, do? Which team is the dark horse? Which team will tumble into the depths of last place? Those questions will all be answered. Following their Stanley Cup Finals victory, the Red Wings decided it would be best to sign another sniper — Marian Hossa. Surely, this will keep Detroit in the upper echelon of the Western Conference, but things will not be as easy this year. Goalie Dominik Hasek finally retired and defenseman Nick Lidstrom is one year older, as is Chris Chelios. Age has always been a factor for Detroit but they are winners in Hockeytown. However, the Central division, which Detroit is a part of, has been retooled and looks very formidable for the defending champs. The Chicago Blackhawks are the team to watch in this division, and in the whole NHL. With their two young stars, Jonathan Toews and Patrick Kane (both could be sophomores or juniors with us here at Virginia Tech), Chicago could easily challenge Detroit for the division crown. Its defense has been bolstered with offseason acquisition Brian Campbell, bringing offense to their blueline. The question mark for Chicago is its goaltender, Cristobal Huet. If he can match his second half of last season with Washington, Chicago will be in tremendous shape. Let’s head back east and take a look at the defending Eastern Conference champions — the Pittsburgh Penguins. The Pens lost quite a few players in the offseason, namely Gary Roberts, Ryan Malone and, of course, Marian Hossa. This is going to hurt them this year. They are in one of the most difficult divisions in hockey, the Atlantic. Philadelphia is the main opponent for the Pens. There was not much movement by the Flyers except a huge contract extension for young franchise man Mike Richards. The past year allowed Richards and Briere to gel, and let Braydon Coburn break out into a top defenseman. The Rangers lost a lot with Jaromir Jagr going to Russia. All of that experience and scoring is now halfway around the world. The pressure now solely rests with centers Scott Gomez and Chris Drury, both entering their second year in Madison Square Garden. The Rangers front office did help the loss of Jagr by bringing in Markus Naslund and blueliner Wade Redden. It will be a three-team race for the Atlantic title, but all three will end up in the playoffs. That means the Devils are out. We will stay in the Eastern Conference and look at the Southeast division, won last year by Washington. Alexander Ovechkin proved again why he is one of the best players in the game, every bit as good as Sidney Crosby. There is a problem for the Capitals, though — the Tampa Bay Lightning. Tampa yanked Barry Melrose away from ESPN to be head coach, and with a slew of signees things look bright for the Lightning. This is the dark horse for the NHL. It would not be surprising for them to make it to the Eastern Conference finals, if they can sure up the goaltending. Wrapping up the east is the Northeast division. Montreal goalie Carey Price, said to be the second coming of Patrick Roy, proved his worth last year. The Canadians dumped some useless salary and are still attempting to bring in will-he-or-won’t-he free agent Mats Sundin, your Roger Clemens of hockey. They should finish first in the division. Montreal’s archrival, Boston is going to turn some heads this year. Barring any more injuries, they will be contenders, along with Ottawa and Buffalo in the division. Ottawa is going backwards, and Buffalo is at a stalemate. Now is the time for Buffalo to make its move. Watch for a big trade deadline deal for the Bruins. Back out west, we find the Northwest and Pacific divisions. In these two, you will find some of the best goaltending and defense in the NHL. It’s all about hardnosed hockey here, with the occasional sprinkling of offensive firepower in San Jose and Detroit. The Northwest division lost a lot of talent and players shifted around to teams in the same conference. Anybody can win the Northwest — it’s that simple. Every team has a solid defense backed by exceptional goaltending. The Pacific division is home to a perennial regular season powerhouse, the San Jose Sharks. The Sharks’ problems come in the playoffs, and that is why they fired their coach Ron Wilson last year and brought in one of Detroit’s assistant coaches, Todd McClellan, to give the team a new, winning attitude. This coupled with the addition of a revamped blueline — Rob Blake, Dan Boyle and Brad Lukowich — means the pieces are once again in place for a deep playoff run. The Stars and Ducks are going to give the Sharks everything they can handle, though, especially with goalies like Marty Turco and Jean-Sebastien Giguere. Anaheim did not make any huge moves in the offseason, and Dallas lost a few key players from their Conference Finals run. That will not stop them from competing though. Both teams have superior coaches. With all of that said, this looks to be another fantastic hockey season. More and more fans are tuning in and attending games, bringing back the love for hockey in America. It is truly a great and exciting sport. There is nothing more emotional in sports than seeing players lift the Stanley Cup after a strenuous eight-month journey. That journey begins tomorrow.